Grilled cheese can seem like a luxury item. It’s cheesy, greasy, fatty and rich. But not always. I actually prefer my sandwich with a little less cheese but interesting choices. Don’t limit yourself – use what you have, try something new and edit to fit your tastes. I made grilled cheese open-faced so I can taste the cheese a little more and feel less full from the bread. The edges get crisp and the bread remains toasty. Introducing an aged cheese keeps the palate guessing and adds depth to your dish. This recipe is simply one of the endless possibilities. The sauce is optional, but great if you make your sandwich with aged white cheddar. P.S. If you haven’t gotten one already, purchase, borrow, dare I say, steal, a Microplane. It helps keep your Grilled Cheese light without losing flavor punch. 1) In a little dish, mix together ketchup and Worcestershire sauce with a fork. Set aside. 2) Slice bread 3/4″ thick, set oven to broil with rack placed in the top third of oven. 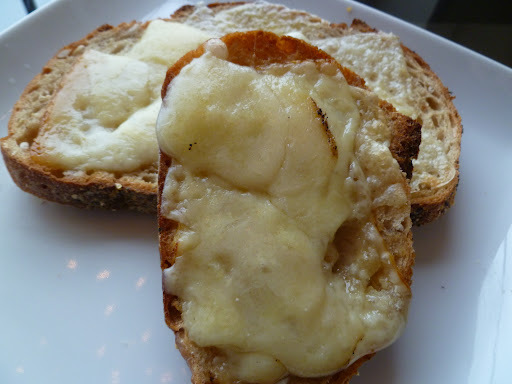 Using a vegetable peeler, make thin slices of Gruyere and Cheddar; layer over bread. Use Microplane to zest Aged-Gouda, creating a light dusting of cheese. 3) Carefully place directly on oven rack for 1-2 minutes. If you’ve cut the bread a little thin or it seems flimsy, use a baking sheet. Once cheese has melted, let sit for a minute. 4) Dip into sauce and enjoy!